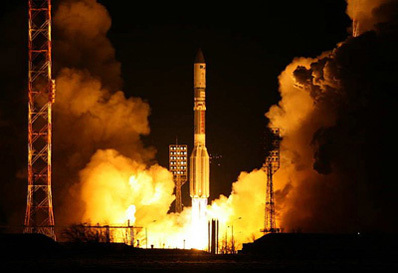 A new high-definition television broadcasting satellite was deployed by a Proton rocket early Tuesday, bolstering DirecTV's programming lineup for customers in the United States. The DirecTV 12 satellite was bolted atop the 191-foot-tall booster for liftoff at 0022 GMT Tuesday (7:22 p.m. EST Monday) from pad 39 at the Baikonur Cosmodrome in Kazakhstan. The Proton's three core stages heaved the satellite and Breeze M propulsion module on a ballistic trajectory less than 10 minutes after launch. The Breeze M's main engine ignited two minutes later to put the spacecraft in a stable parking orbit, according to International Launch Services, the U.S.-based launch provider. Four more Breeze M burns overnight propelled DirecTV 12 to higher altitudes and reduced the spacecraft's orbital inclination. Spacecraft separation occurred on time at 0932 GMT (4:32 a.m. EST) Tuesday, and ILS declared the company's seventh mission of 2009 a success. 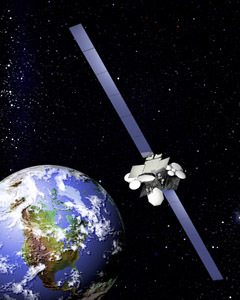 DirecTV 12 was expected to be deployed in an orbit with a high point of 22,236 miles, a low point of 3,181 miles and an inclination of 20.7 degrees. The communications payload weighed about 13,000 pounds at launch, filling nearly all of the Proton rocket's lift capacity. ILS and Russian rocket-builder Khrunichev have implemented several recent upgrades to the Proton to give the booster the power to launch such large satellites, according to McKenna. "DirecTV placed their trust and confidence in ILS two years ago with a very significant launch with the DirecTV 10 satellite. At that time, it was the largest satellite launched by Proton, demonstrating the increased capabilities of the vehicle," said Frank McKenna, ILS president. "Now, with DirecTV 12, DIRECTV once again entrusted their business to us with the continuation of this successful partnership. We are very proud to play a significant role in the expansion of digital television services in the United States with DirecTV." The satellite will fire its on-board thruster several times in the next few days to reach a circular orbit 22,300 miles high and hugging the equator. DirecTV 12 will also unfurl its massive solar array wings spanning 158 feet tip-to-tip. From its station in geosynchronous orbit at 102.8 degrees west longitude, DirecTV 12 will reach subscribers in the continental United States, Alaska and Hawaii. The satellite is designed to operate for 15 years. The satellite will complete DirecTV's phased expansion of high-definition television service to U.S. households. DirecTV 12 was built by the satellite-manufacturing division of Boeing Co. in El Segundo, Calif.
"DirecTV 12 is the third in a line of satellites designed for delivery of high-definition television service to DirecTV's customers throughout the continental United States, Alaska and Hawaii," said Steve Schmidt, Boeing's DirecTV 12 program director. DirecTV 12 will allow the direct-to-home broadcasting firm to expand its HD capacity by 50 percent, according to Boeing. The satellite will join two identical spacecraft launched in 2007 and 2008. The trio of satellites were ordered to bolster DirecTV's HDTV offering and continue the company's legacy of uninterrupted service. "DirecTV 12 is important to us because it's the last of our three original Ka-band satellites," said Jim Butterworth, vice president of communications systems at DirecTV. "It augments our local channel capability, so we can go to more markets with HD programming. And it also is going to give us the capability to have more movie choices and other services for our customers." After DirecTV 12 enters service next year, the company will provide 200 national HD channels and 1,500 local HD channels to customers. "DirecTV 12 is the 21st in the Boeing 702 line and will provide significant expansion to the already unprecedented HDTV service that DirecTV provides to its customers," Schmidt said. The spacecraft carries 131 Ka-band transponders for nationwide service and local programming. The communications payload uses two 9.2-foot reflectors and nine smaller antennas. ILS announced a new initiative this fall to launch two payloads on a single Proton rocket, making the booster competitive for medium-class satellite missions beginning in 2012. "We will launch two intermediate satellites on the Proton system to (geosynchronous) transfer orbit, and that will create a significant offering in that segment of the market, in which we have not participated previously, at very affordable prices and reliability," McKenna said. The launch provider is partnering with Khrunichev and Orbital Sciences Corp., a leading builder of small communications satellites. The Proton Duo service aims to shave 20 percent from the cost of delivering each kilogram of payload to orbit, according to ILS. Monday night's launch was the 10th mission overall for the Proton rocket this year.